Getting my badass in gear to finally fill in my blog with Recipes, thoughts and general day to day craziness! I am constantly perusing recipes on my phone. If I find something interesting I place it on my desktop, or if it looks really good, I print it and 95% of the time try it. Because of the internet, my ridiculous collection of cookbooks has been reduced to three shelves instead of six, with a promise to never buy any more COOKBOOKS! That didn't last long when I saw used cookbooks on chocolates and desserts by Alice Medrich . I mean honestly, the most expensive of the four was under $7 and was in Excellent condition. Then there was the Julia Child and Jack Peppin cookbook for $1 at a church sale. That is not really buying a cookbook, it is a donation. I delude myself often!! My latest recipe find was Doughnut Muffins from the King Arthur website. I dislike muffins-if I want cake I will eat cake- but Iove donuts but don't eat them because they don't "agree with me." That is such a funny saying, like the doughnut is pro life and I am pro choice, it doesn't agree with me so I won't eat it. No, it repeats on me, yet another funny expression, as if all day it reminds me I ate a doughnut. Well that is actually exactly what it does! I digress, I made this muffin immediately because if it tastes like a doughnut...nirvana! I made the recipe as is, almost, I added a strawberry rhubarb layer (it is RHUBARB season) and it was incredible. It tasted like a doughnut! So knowing the recipe works, the next step was to make it vegan! I have had many many failures trying this transition but have gotten to the point where I know pretty much what will work and what will not. I have become fearless with flaxseed meal. I immediately substituted 1 T of flaxseed for each egg with 3 T of water. The butter was changed out for Vegan Smart Balance and the milk cashew milk. The flavor was fantastic, it tasted just like a doughnut! I would use soy milk next time because it is thinner than cashew and the batter was very thick. I froze all the muffins. 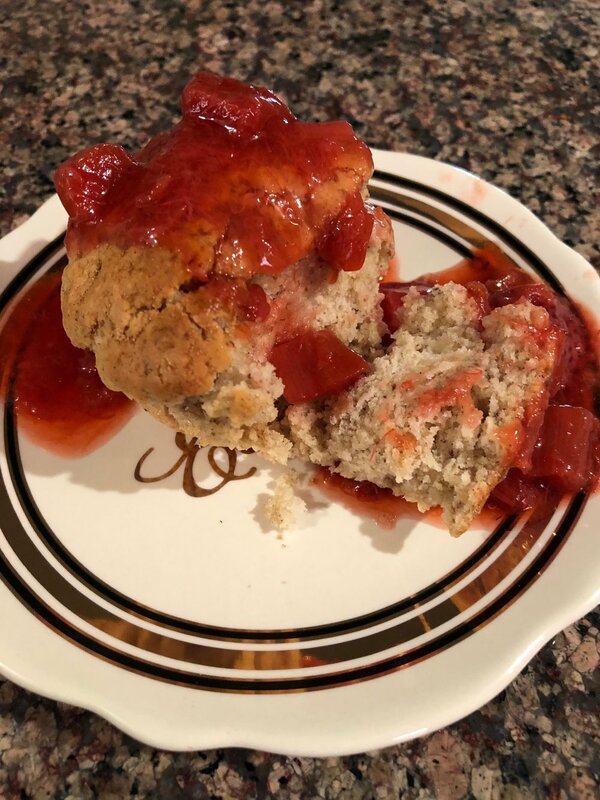 Breakfast this morning was so obvious, a vegan doughnut muffin slathered in strawberry rhubarb compote. I'll post the recipe for that next!! Add the liquid flax seed mixture beating to combine. Stir the flour into the margarine mixture alternately with the milk, beginning and ending with the flour and making sure everything is thoroughly combined. The vegan batter was very thick and needed more liquid because the cashew milk is so thick. Add 1/4-1/2 cup water to get a thinner batter consistency if you use a thick nut milk.